My boys ask the same question every day. “Can my friends come over today”. It doesn’t matter if they’ve seen their friends all day at school. It doesn’t matter if they’ve just returned home from their after school activities (which they do with their friends). It doesn’t matter if they’ve had friends over or been at friend’s houses every day this week. It doesn’t matter if they’re sick. Or tired. Or what time of day it is. It’s always the same question. As I headed home from school with a car full of 12 year old boys we were clearly at question 2. They were suggesting a pizza night! Or maybe a hot dog night! Or tacos! I told them they could stay as long as they were prepared to eat salmon and lentils. They all went home for dinner. Q3 didn’t even come up!!!! We enjoyed this dish. It was hearty and satisfying. And surprisingly easy to make! That’s what I’ve come to love about French Fridays with Dorie. It’s become very much a family thing. We talk about the recipe of the week. The kids ask questions and they feel they are part of something bigger. They are more open and willing to try new things because they believe their opinion of the final product is valued! I can’t wait to see what the other member of French Fridays with Dorie thought! 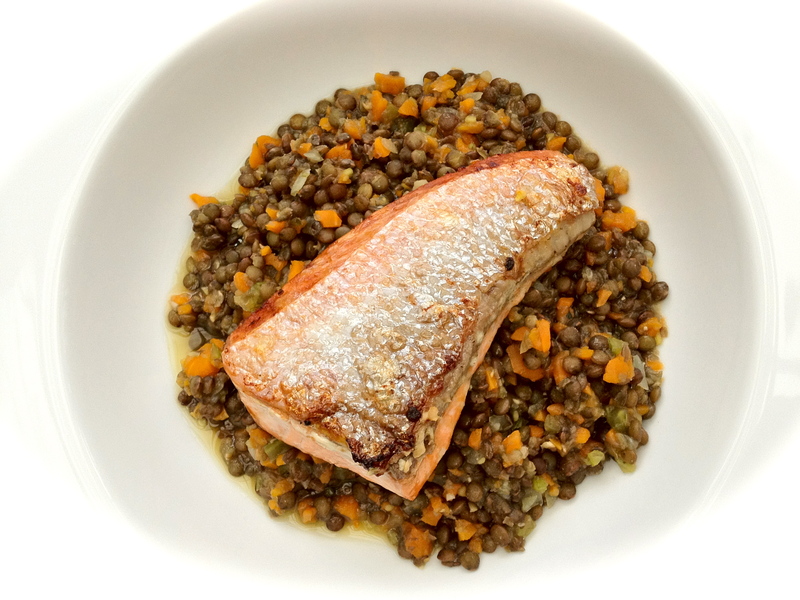 Tags: cooking, food, french food, french fridays with dorie, lentils, salmon | Permalink. Wow! The power of salmon and lentils avoided question 3. Great post! Oh, too funny! I bet every one of those kids would have enjoyed this dish. Your lentils look really pretty! I didn’t think mine looked very nice, but I liked how they tasted. I used half chicken broth and half water and I think that really helped give them some flavor. Great photos! Great post! First you had me laughing out loud and then feeling a little sentimental. I too am so happy that I am participating in this cooking group. Every week my husband asks me which Dorie recipe we will be making and it has really opened us up to new dishes which we never would have tried on our own. Funny! Very nice photos. I was surprised by the simplicity and yet the elegance of this meal. 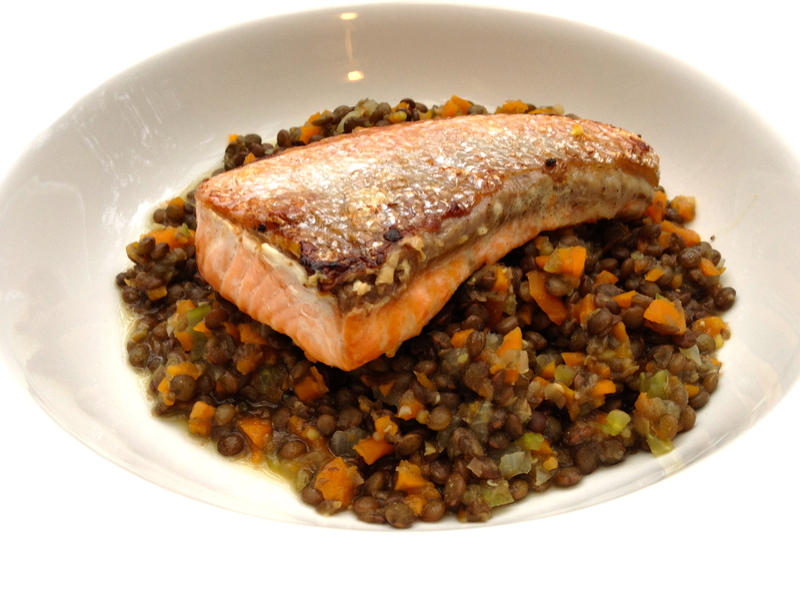 I would have never thought to pair salmon and lentils, but it worked well. And, I’m happy for you that you had a nice family meal without all the friends…you’ll have to try this one again when you need good family time. Haha! I’ll keep this strategy in mind for when my son is school aged. That’s one way to drive out unwanted slumberers. HaHa! – my son’s friends would have done the same even thought lentils are his favorite. Great post! That was too funny! My grandsons wouldn’t try the lentils but, they loved salmon! Your salmon looks wonderful! Have a great weekend! I loved your story, Sanya. I didn’t know whether to be happy for you or sad for the friends who decided not to stay for dinner. They missed a lovely meal. Nice pictures. The conversation sounds familiar! Your dish looks wonderful and delicious. I love your story, very funny. Oh, I remember those days! The boy not so much, but the girl, oh my. I was beginning to believe that living for the girls was like a progressive dinner. They were always to together and believed they should spend the night together every night. Your lentils and salmon look wonderful. Glad your family enjoyed them. I loved your anecdote, especially the part about the kids going home. And, your last graph was exactly what this is all about – gathering around the table and trying something new that has been discussed and “dissed” and planned all week. There is much more to FFWD than a recipe, isn’t there? LOL! What a great way to clear out your house and have a nice dinner with just your family! … I think we are all guilty of doing this to our parents, and now we have to pay! Hehehe! 🙂 Great job! I love that you left the skin on! My fillets came skinned already, which made it a pill to get off the baking sheet but I didn’t have to scale it either, so I’m grateful! Oh, wow! I love the new look of your blog….beautiful! Yeah, my youngest was wishing he didn’t have to eat at our house the night I served this…LOL. That sounds just like the conversations I used to have with my boys. Glad you all enjoyed this one, we did too!